CODE International’s Pakistan Chapter (CODE-ENC Pvt Ltd) in cooperation with SSBC- COMSATS University Islamabad is organizing an international techno-entrepreneurship conference entitled Entrepreneur’s Show-Isb2018 on 10th October 2018, Wednesday in the Seminar Hall, EE Department, COMSATS University Islamabad. 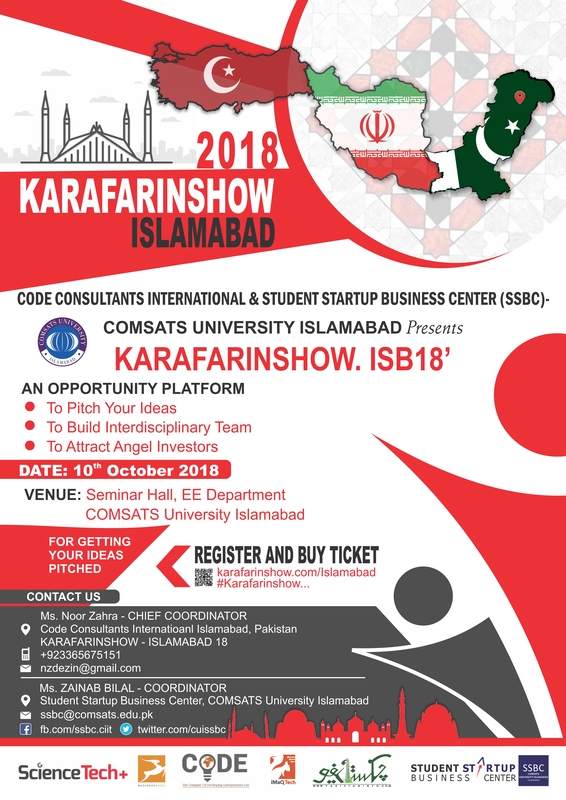 KarafarinShow events are being organized in different cities of ECO countries and will provide an excellent opportunity all CUI Students to be inter-connected with entrepreneurs from Iran, Turkey and other regional countries. Entrepreneur’s Show-Isb2018 invite you to join us in your hometown. In case of any query regarding Idea submission, feel free to contact. Registration is free for all COMSATS University Students. During registration all CUI Students are requires to write their registration# in the box of title of ideas & description. For any further query or information do not hesitate to contact. Please find attached file " Brochure"
KarafarinShow is the network of 7000+ academic entrepreneurs-researchers, 3000+ international students from GCC, ECO and BSEC Countries with 500+ ideas registered and more than 20 past events in GCC, ECO and BSEC countries."